We researched eight climbing (aka crag) backpacks, and these six were chosen to represent a wide range of the basic design approach. Roughly speaking, these designs could be categorized as: Briefcase,Duffle, Haul bag and Burrito. They ranged from simple to complex. Some were organizational wizards, while others opted to be simple storage and hauling vessels. 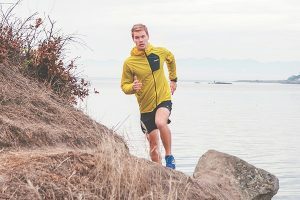 Brands designed most of the chosen crag packs specifically for sport climbing, with some brands offering separate crag packs aimed at traditional climbing. 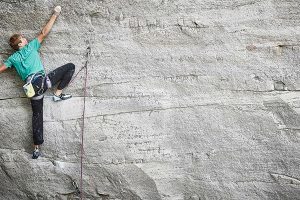 Over three months of testing during guiding and personal single pitch sport climbing days, multiple times per week, netted the results. Guiding clients and partners were also encouraged to trade packs for parts of each climbing day, with opinions noted. 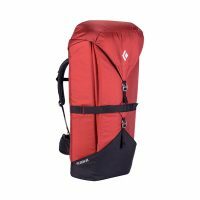 The Best Crag Packs of 2017 was Gear Institute’s first test to treat crag packs as a standalone product category. The Metolius Crag Station has a simple to use design, and incredibly tough materials allow the climber to dump gear in, throw the pack down, get gear out and climb with no fuss. 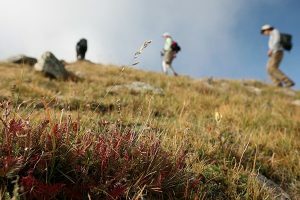 The haul bag type materials, large zippers and ballistic fabrics mean no worrying or being cautious with your gear, and the single main zippered duffle bag opening makes getting gear in and out at the cliff a simple and quick affair. 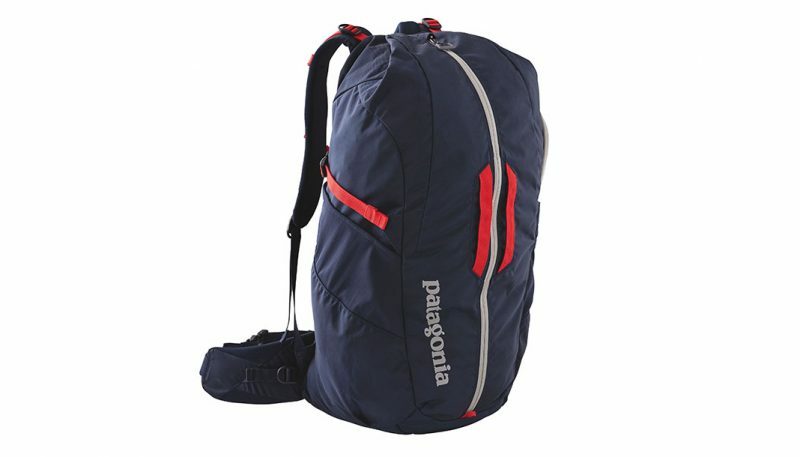 The padding and comfort of the shoulder straps on the Patagonia Crag Daddy 45L (blue) were superior to those on the North Face Cragaconda. 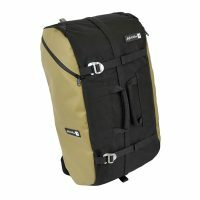 The most comfortable crag pack by far was the Patagonia Crag Daddy 45L. 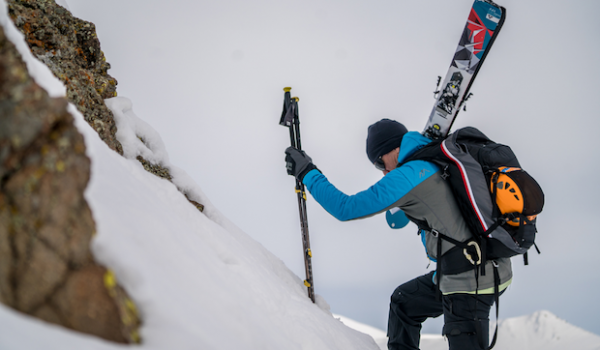 The well-designed suspension system, with its generously padded and sculpted straps, catapulted the pack to the top of the comfort scale. Mesh on the contact points with the body added comfort when the temperatures were higher, allowing some breathability to aid moisture management. It also comes in two sizes to match torso length which is rare to see from other brands building crag packs. The back panel had adequate padding when packed correctly, but haphazard filling and lack of a solid frame sheet allowed metal climbing hardware to create pressure points on the back, a problem that occurred to some degree on all the crag packs that lacked a solid frame sheet. 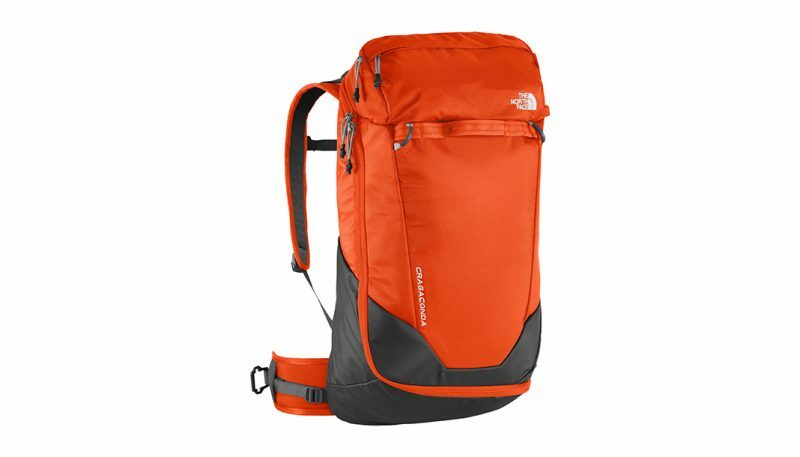 The ability of the aluminum perimeter frame and tensioned mesh panel to move and conform with the trunk, and its superior shoulder strap padding, pushed it just ahead in this rating category over the second place finisher; the North Face Cragaconda. The Cragaconda did have a frame sheet, which prevented pressure points. It also proved good mobility on the steep, craggy approaches of many climbing areas. The DMM Flight 45L has a frame sheet, but the small footprint and lower density padding limited comfort with anything beyond a light sport climbing rack. The Metolius Crag Station and the Black Diamond Equipment Pipe Dream 45 suffered due to a lack of any rigid suspension components, while the Trango Crag Pack’s back panel lacks air circulation, which lowered its Comfort/Fit rating. 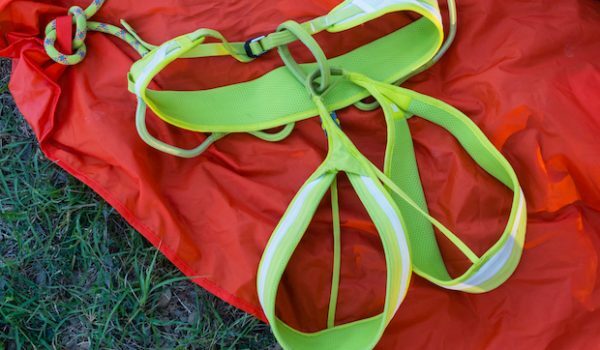 The tensioned mesh “trampoline” suspension system of the Patagonia Crag Daddy 45L provided weight transfer while allowing extreme mobility; the North Face Cragaconda had a frame sheet with stays that didn’t have quite the same mobility. 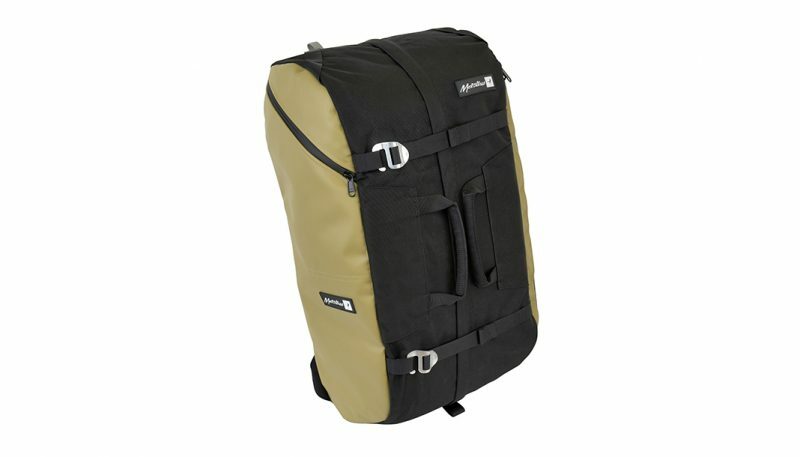 The Patagonia Crag Daddy 45L also walked away with the highest stability rating. 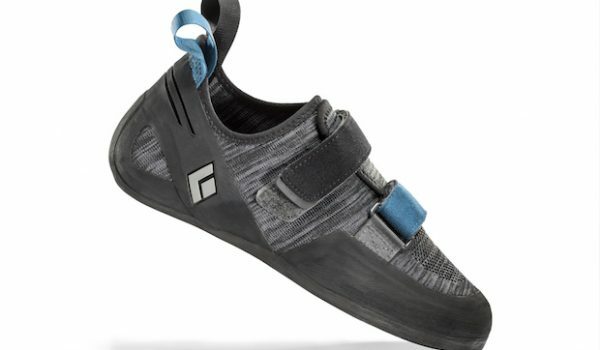 All the things that contributed to the fit/comfort also played into this rating, as well as the shoulder strap load lifters and hip belt control straps. 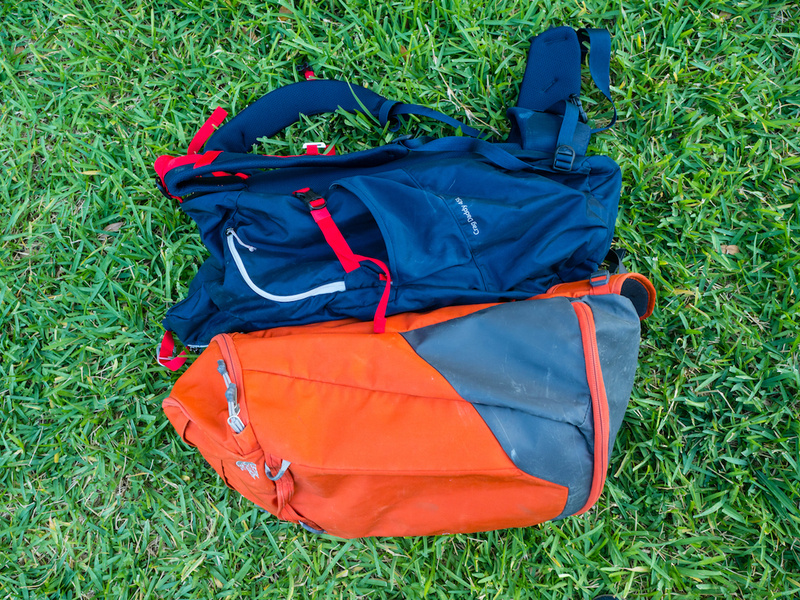 This crag pack essentially had all the stability enhancing items fully featured backpacking packs have, which allowed it to handle heavier climbing loads effectively. The North Face Cragaconda also scored high in Stability; the only ding was the lack of compression straps, which allowed loads to shift with a partially filled pack. 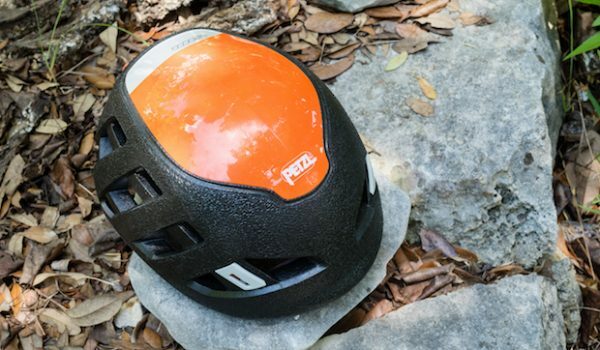 The Metolius Crag Station fared well, the larger surface area of the back panel and compression straps provided the necessary stability for sport climbing loads. The Trango Crag Pack had a load shifting problem from no compression straps, and the larger volume made it more likely to be partially filled. 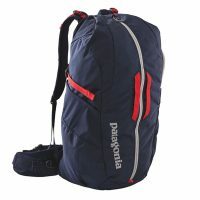 The DMM Flight 45L also lacked compression straps and the small footprint on the back added to instability. The Black Diamond Equipment Pipe Dream 45’s lack of rigidity and tall stature made acquiring stability (through careful packing) challenging. 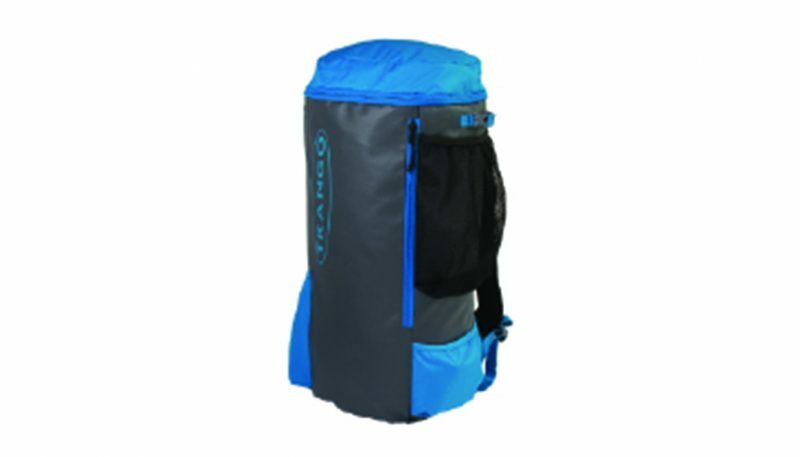 The Trango Crag Pack’s large haul bag style dimensions gave it the edge regarding storage. It was the only crag pack in the test that could accommodate a full load of traditional climbing gear. The 48L capacity trumps the others by a few liters, but the single tubular space and full sized top opening allowed packing large volumes of gear. Generous external pockets handled larger water containers, guide books, and a mesh pocket facilitated shoe drying while switching cliffs. The lid also had a zippered pocket, and buckled straps on each side of the pack accommodated extra ropes, clothing and stick clips. 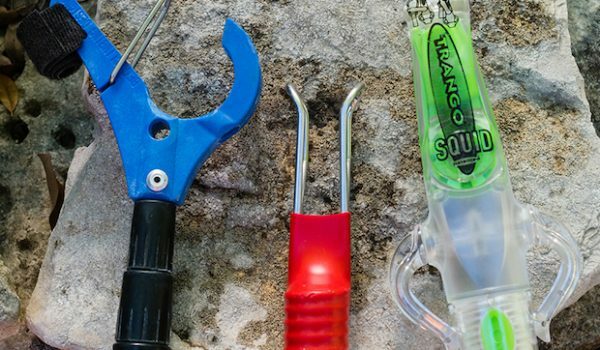 Whether clipping bolts or placing pro, the Crag Pack’s storage capacity ruled all others. The North Face Cragaconda, Patagonia Crag Daddy 45L, DMM Flight 45L, and Black Diamond Equipment Pipe Dream 45 all tied with a lower score due to being limited to sport climbing gear. The Metolius Crag Station scored the lowest; similarly limited to sport climbing gear but with the added disadvantage of no exterior rope storage. The Metolius Crag Station’s burly materials and bomber construction gave it a rare rating of 10 out of 10 in the durability department. The “Durathane” haul bag material and ballistic nylon thwarted even slight damage after being dragged across rough granite and sharp limestone. The duffle style bag’s main zip was a large YKK #10 with huge nylon webbing zipper pulls. Two compression straps, with crush proof metal buckles, ran across this main zip to alleviate strain when the pack was overstuffed. The North Face Cragaconda scored next highest; the main fabric was 840d PU coated nylon with a nylon inner liner, which saved it from abrasion from both sides. The metal hip belt buckle also added to the Durability score. 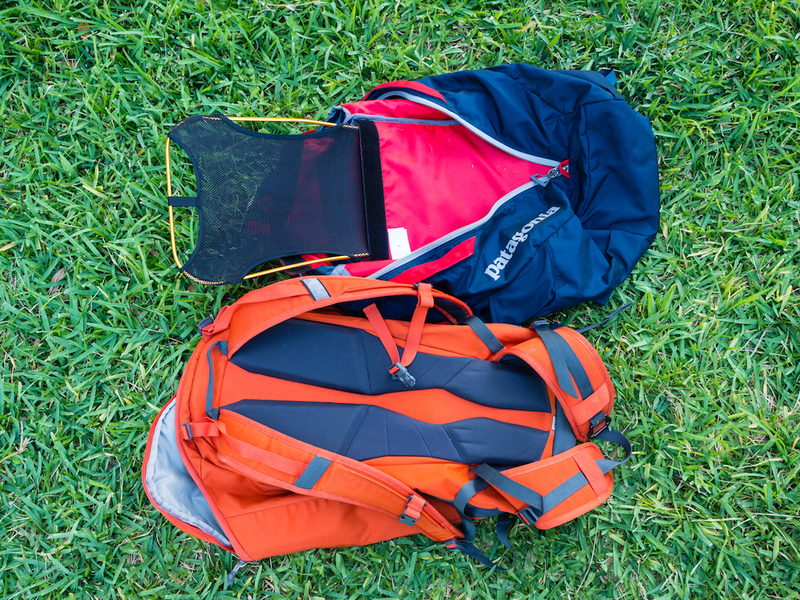 The Trango Crag Pack’s haul bag type material helped it garner the next highest score. The remaining packs all proved durable and scored well, just not as well as these. 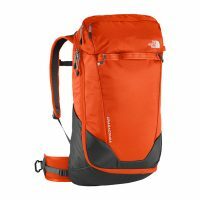 The lack of compression straps on the North Face Cragaconda negatively affected stability; no such issues on the Patagonia Crag Daddy 45L. The North Face Cragaconda and the DMM Flight 45L were tied, both having features that covered all the bases for sport climbing. Each had a rope tarp, external helmet sling, racking loops, internal pockets for bulky items; these packs organized gear brilliantly. 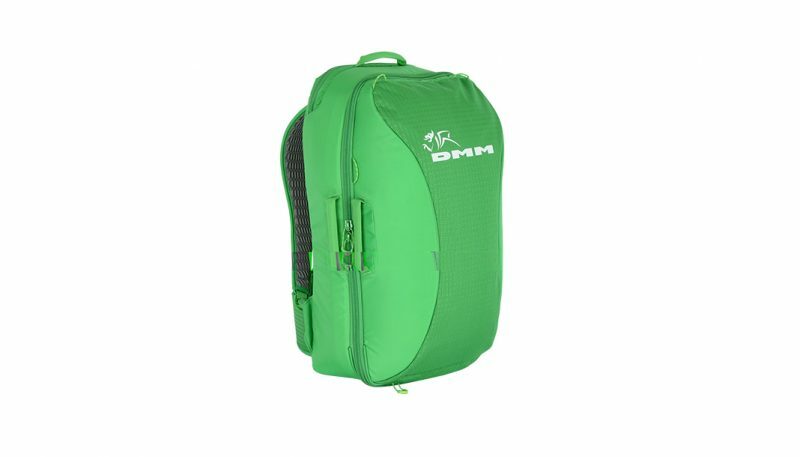 The DMM’s square shape carried a stick clip easily, but the North Face had a padded front panel, which was welcome when donning and removing rock shoes. The nod went to the Cragaconda since this single feature was used on every route, and carrying a stick clip was still possible, just not as easily as on the Flight 45L. The Trango Crag Pack’s myriad of simple additions, including exterior mesh shoe storage and a pocket shaped and sized for guide books allowed it to come in the runner-up position along with the Black Diamond Equipment Pipe Dream 45, which had the unique ability to fold out into a comfy crash pad. The remaining Patagonia Crag Daddy 45 and Metolius Crag Station shared the duffle bag design, which limited available extras. Rock climbers may beg the question, “why not just use a regular backpack?” Although a standard backpack will get the necessary items to the base of the routes, most would require careful packing of small, dense and loose items. 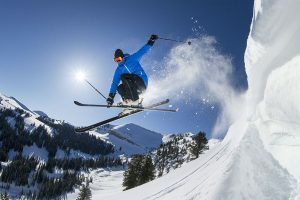 It would likely necessitate taking all the contents out to gear up appropriately, leaving unused items out to prevent repacking between routes. Crag packs are designed to ease access and organization of climbing hardware and softgoods, and they prevent forgotten or lost items, most having easily visible organizational systems to identify anything amiss. Most move from route to route more easily as well, withouth gear stacking on top of each other, and if so, they have a way to reach deeper packed items without unpacking. 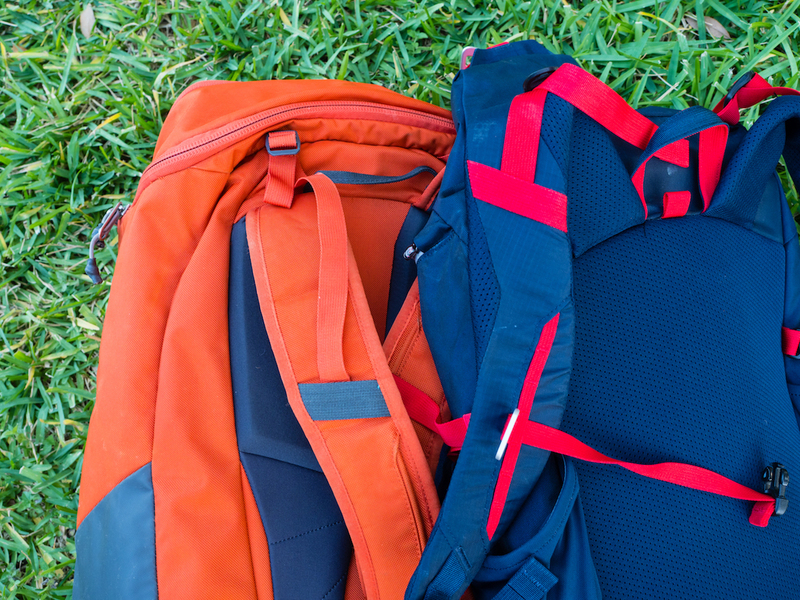 A well-designed crag pack makes the necessary actions of packing for the day, readying for each route, and getting repacked to leave more pleasant and efficient. 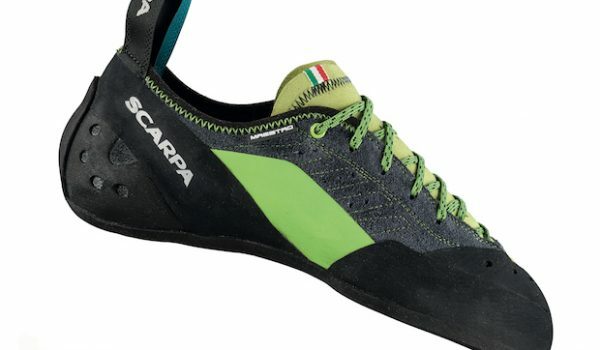 The crag packs in this test were best suited, and most likely designed, around sport climbing. 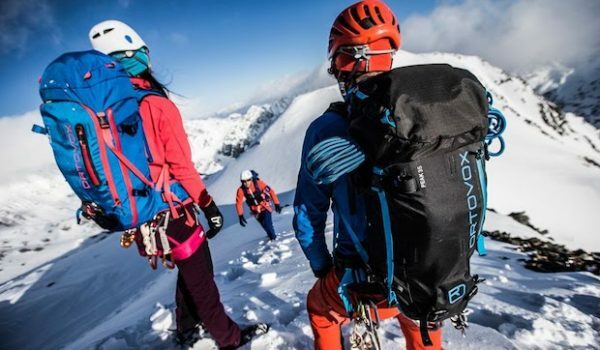 A few companies offered different crag packs aimed at traditional climbing, and this trend should expand. Traditional climbing oriented crag packs need to be larger in volume, packed differently and be extremely durable. The dense nature of traditional climbing protection the amount of gear required calls for much heavier loads and larger overall volumes. 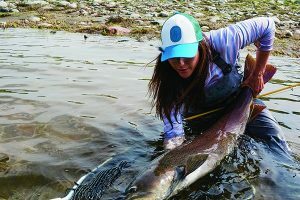 Getting all that gear into a smaller package becomes more important than convenient features that add to the dimensions of the pack without increasing carrying capacity. These crag packs will likely look a lot more like normal packs but have at least racking options for the vast array of hardware that needs to be tracked and packed. Durability is key since climbing up abrasive slots and chimneys is often a part of traditional climbing routes. The crag packs were tested mostly in sport climbing situations, both during single and multiple day excursions from a base camp. A standard sport climbing set up of a dozen draws, 70 m rope, harness, chalk bag, shoes, helmet, guide book, stick clip, snacks and layers were used, and approaches took an hour or less. 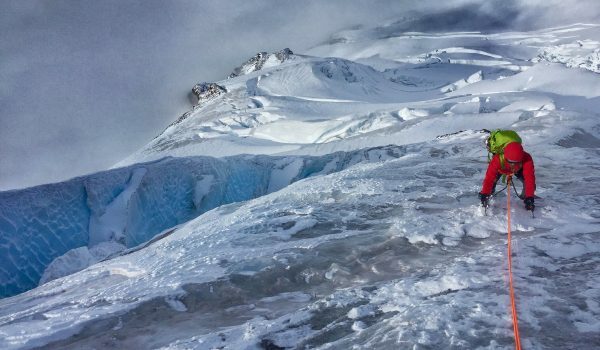 Climbers usually visited multiple areas each day, necessitating several cycles of unpacking and repacking. 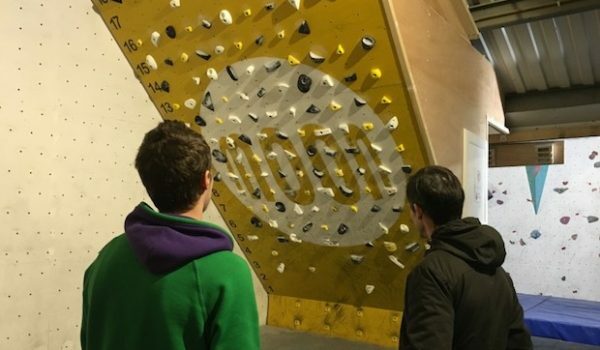 Testing via trad climbing was done when capacity allowed and consisted of single pitch routes scattered over large areas, both in single-day and multiday outings. 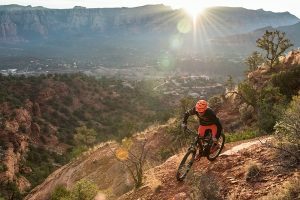 What is a Crag Pack? 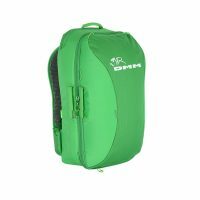 A crag pack is a pack specifically designed to transport, organize and allow for efficient access of rock climbing gear. A typical day at the cliff has the climber reach the first area, flake the rope out, put the harness and chalk bag on, rack up with the appropriate gear, put shoes on, then finally climb. Between routes, gear is removed and put back into the pack. Often, snacks and hydration are also needed. Upon completion of the desired routes in that area, repacking ensues, except the harness, and it’s off to the next area. All this repeats until the final route in the last area is completed. Then everything is packed up and hiked back to camp, or the vehicle to end the day. Multiple unpacking, repacking, and gear swapping scenarios happen during the day, where items are easily misplaced. 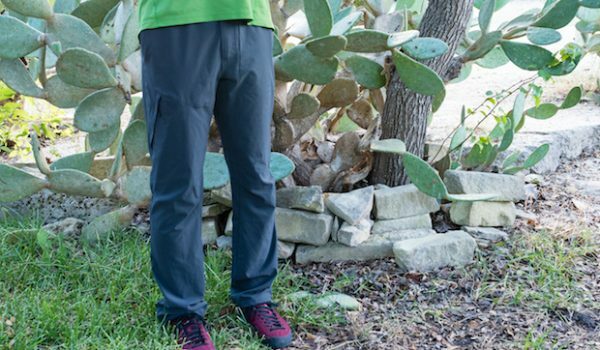 Crag packs are designed to alleviate potential issues and lend efficiency to the most commonly recurring steps. 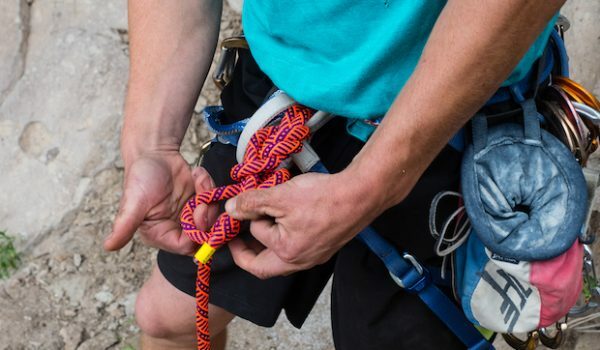 Racking loops to clip hardware, mesh pockets for soft goods and a way to carry the rope are primary organizational needs, along with having a place for everything required for a day outdoors. Durable materials are a must to ward off the abundant surfaces where the user is often squeezing between them or hauling the pack up. Metal hardware with sharp edges threatens the interior surfaces. Heavier ballistic nylons and heavy PVC haul bag materials are common and warranted. Crush proof buckles, large zippers and heavy duty loops for hauling are also valuable. Exterior daisy chains and lashing points are plusses for quickly clipping items on the go, accommodating bulky layers or a second rope. 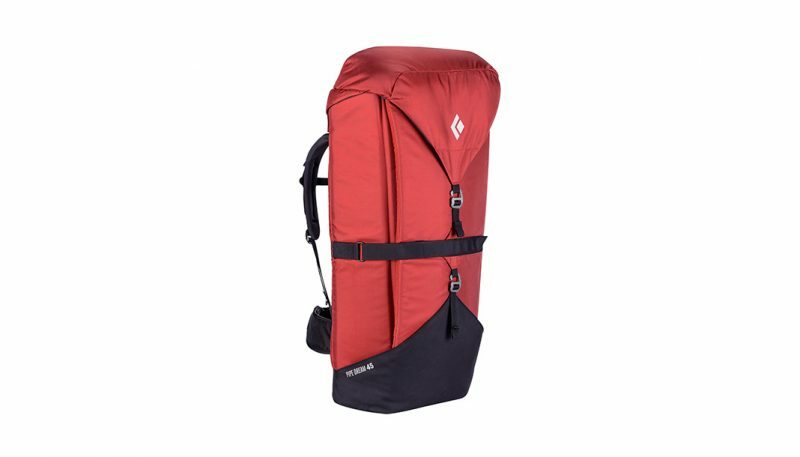 MSRP for these crag packs ranged from $99-$179. For the most part, the quality of materials and features rose concurrently with the price tags. 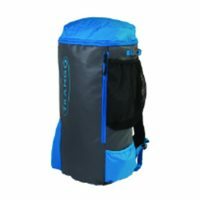 The $99 Trango Crag Pack was an exceptional value, particularly considering the volume allowed use for traditional climbing. 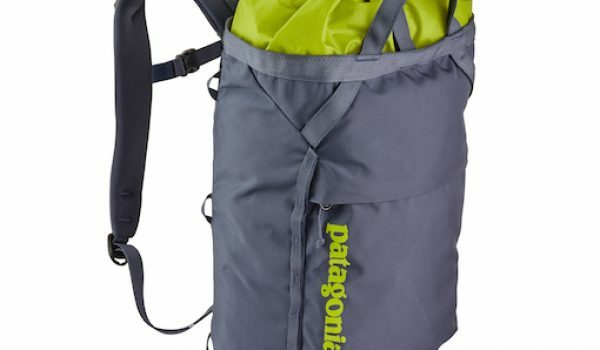 Patagonia’s Crag Daddy 45L sat at the high end of pricing, but it did have the most involved suspension system and the associated brand allure and sustainability stance.